I want this so bad-- I can't stand it! My inner child is throwing a mammoth tantrum as my adult eyes look but can't find a space to turn this photo into a reality. How would you make your nook special? AHH! thank you for this! 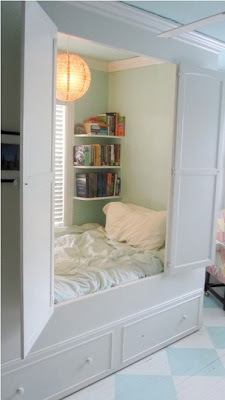 I am in love with little nooks like this and collect pictures and ideas for when I get my own house. I really want a nook/special place for each person in my family when I have one. That way everyone has a place that is theirs and they can be left alone in and dream in. Right now my special place is a window seat 7 stories high in the highrise I'm living in right now. It's cozy and has a great view! You made me laugh thinking about what I used to do when I was little. I had a little spot next to our bookcase, in back of my mom's recliner, and I would sit back there and read. It was "My personal space" that I carved out for myself. We all need a "personal space". That picture is very cool. That most definitely would have been my little girl heaven (specifically, reading Sweet Valley High books in that amazing secret space!). HOW FUN! oh my gosh!! That is my dream room!!! I have serious nook envy now! I love this! I would fill mine full of white fluffy things and lots of books! 7-year-old-me used to make multi-room tents/forts out of the pillows and blankets in my living room. it was legit. I LOVE THIS. This makes me want to move to a loft so I can make THIS my bedroom.